This past weekend while I was reading the paper I decided to take a look through the Sunday paper’s coupons. (By the way, there is almost never anything that isn’t processed, full of chemicals or full of high fructose corn syrup in the coupon items). Anyway, to my delight (NOT) I found this (see below) the first of the Pinktober ads that we will soon be inundated with, everywhere, during breast cancer awareness month or what used to be known as OCTOBER. I already feel more hopeful . . .
Wee! Apparently, just like Christmas, retailers make sure it starts earlier and earlier each year. So now Pinktober – the month of breast cancer “awareness” hell – apparently begins a month early. Why should I be surprised. Costco is already selling Christmas items. And why not let them get a leg up on Pinktober? After all, they are curing cancer right? Oh, wait, I meant to say they are “re-branding” . . . isn’t that what Susan G. Komen calls it when they solicit corporations to pay to be pink? The above pie chart was created by Cancer Culture Chronicles. Her post “Komen By The Numbers: 2010 And Still No Answers” is a major eye opener on Komen, their expenditures and just how it is that Komen has a “four star rating”. And for a breakdown of the math behind where your money goes, see these two posts by Uneasy Pink: here, where she points out that only “two percent of all research dollars go to metastatic cancer research” Uneasy Pink goes on to remind us that metastatic breast cancer is the kind of breast cancer that kills. So what are we racing for anyway? Certainly not a cure. Certainly not if only 2% of the money goes to research for metastatic breast cancer. 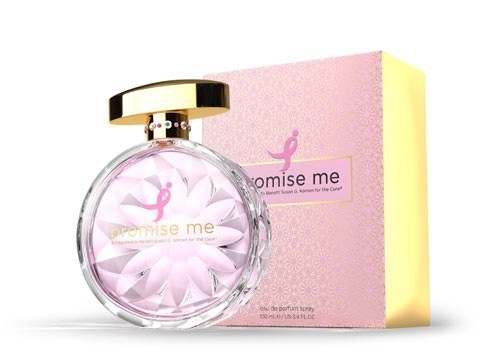 And check out some more math from Uneasy Pink in this post where she calculates that out of the $59.00 purchase price for a bottle of Komen’s “Promise Me” perfume only a stinking $1.51 of the proceeds go to research. PUHleez! Perhaps one of the most outrageous (to me) pink for profit items I have seen are the pink alcoholic beverages. Their Campaign: "Good On So Many Levels" See? We can all feel good when we buy these products even it is a known fact that alcohol consumption increases a woman's risk of breast cancer . . .but, whatever, right? “I went to pick up some of the Mike’s Hard Berry, I was told it was temporarily replaced for Pink Lemonade, due to Breast Cancer Awareness . . . I noticed the proceeds were also going to Breast Cancer Awareness Research, so I went out and bought a whole case.” (Emphasis added). 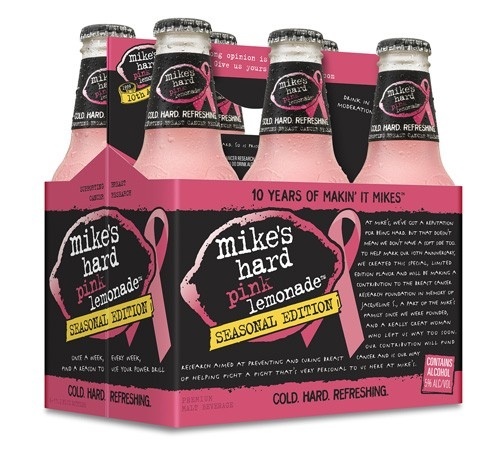 For more on Mike’s Pink Hard Lemonade’s “Good On So Many Levels” (blech) campaign, and more customer comments where they claim they are purchasing more because of the good it is doing, click here: (By the way, what is “breast cancer awareness research“? I think the buyer may have meant breast cancer research . . . who knows . . . who cares – it sells). I do not like Pinktober. So what is my problem with breast cancer awareness month? Why does it bother me, you might ask? Isn’t it good to increase awareness? Isn’t it good to raise money for research? Sure, but, when so little actually goes to a cure and when so many products in the pink bandwagon are actually dangerous and increase the risk of breast cancer and other cancers, I feel it is at best disingenuous. But most of all, I do not look forward to being asked to donate a dollar “for the cure” every time I go into a grocery store checkout (when I know that only pennies of that dollar ever go to research and far less goes to research for metastatic breast cancer – remember – the kind that kills). I do not look forward to the wall of pink crap food at the entrance of and through every aisle every grocery store (I have yet to find a remotely healthy product that has gone pink . . . maybe this year I will find one). I do not look forward to the false hope that pink sells. Komen's "Promise Me" Perfume (or what I like to call "Fleur de Fraud"). Cost of this perfume: $59.00. Actual amount of purchase price that goes towards cancer research: $1.51 (Thank you to Uneasy Pink for doing the math). And I especially I do not look forward to my disease, my suffering, my Aunt’s suffering and her ultimate death from breast cancer, and the suffering of so many other women and men being hijacked for profit. I do not look forward to my friends and loved ones – who often have felt so helpless in the face of my illness – manipulated into purchasing items that are pink, tricked into believing it is doing me some good or that it will help some woman out there, when in fact these pink purchases often deliver very little to research. And some, deliver none – their promise in exchange for your money? To increase awareness. We need to move past awareness and sink our dollars (not just pennies of our dollars) into research. And what about the walks and races to raise money for breast cancer? These are often incredibly uplifting events, providing a great deal of support and hope to both cancer patients, survivors and their families and friends. So clearly their IS some value beyond the irritatingly low 19% that goes towards research. Still, in my opinion, not enough. So many show up at these races to do good. I have walked in the past. My friends have walked on my behalf and their doing so has made me feel stronger. Chemobabe wrote a great post about this and dealt with the question of how we can be critical of an organization that makes these experiences (their walks) possible. And for more reading about Komen try Komenwatch and read here, a blog post by one of my online friends Nancy of Nancy’s Point where she asks SGK for an apology. I agree with you Nancy, I think we all deserve one. Okay, so you get it by now, Lisa (that’d be me) is not a fan of pink. And now, hopefully, you will have an understanding of why. I am hopeful that SGK (and others who are taking money in the name of breast cancer research) will find the surge of criticism on the web to be constructive and will prove to us all that they can do better than 19%, will do better and will honor their mission (albeit trademarked) to race for a cure (Registered Trademark, Susan G. Komen). And, just so you know, I have worn my share of pink . . . I wore a pink t-shirt to many chemo and Herceptin rounds. But, I wore that shirt because it had, in very bold, large, black letters the word “FIERCE”. 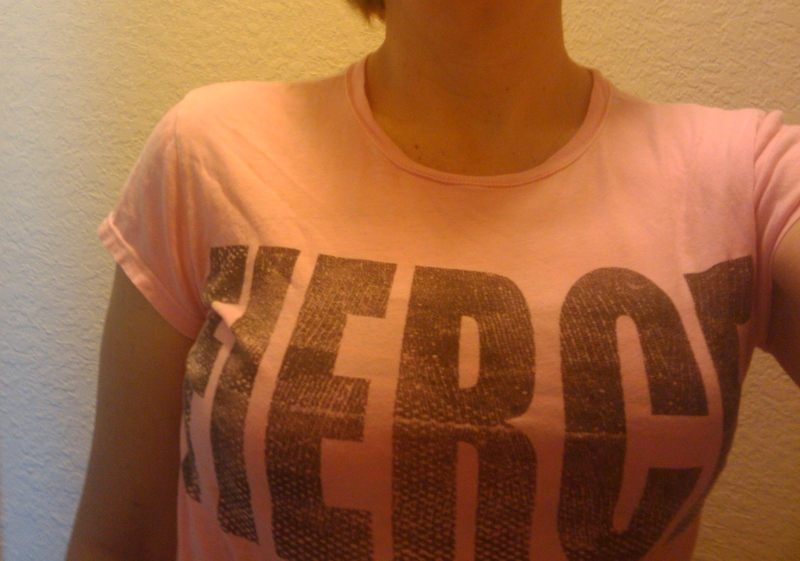 My Mom bought me this "fierce" t-shirt, it was my "F" word for cancer treatment. I loved that shirt. It is faded now, having been through the wash many times and worn many times . . . to chemo, to the gym and sometimes to bed. It was as if wearing that word across my chest (and for a good part of the year . . . across no chest) could influence the battle beneath. Fierce. I could make myself fierce even if I did not feel that way, I could make my cells within my body wage the war I needed waged and conquer the cancer. So, I wore that shirt in spite of it being pink. But, that pink shirt didn’t save me. Research saved me – if I am even saved (I am thankfully, gratefully NED: “no evidence of disease”). Research that lead to the development of Herceptin made it possible for me to still be here. Women who gave their last days of an aggressive cancer to participate in early trials of Herceptin, they saved my life or at the very least, prolonged it. Awareness did not prevent my cancer. Awareness is not a cure. And, we still, after so many years of pink branding, really do need to race towards research to cure all cancers. September is Ovarian Cancer Awareness Month. Yet, the pink starts earlier and earlier. Ovarian cancer gets so little in the first place, even though there is a link between OC and BC, it downright hurts to have Pinktober start to last 5,6,7 weeks. There was a nice piece I saw in a local paper about the town “going teal”(teal is the awareness color of ovarian cancer). I saw it online. At the top of each online page of that publication was an ad for their special Pink Ribbon section, to be published 9/28. Sigh. Grrr. It makes me sick. My family lost a very dear friend to ovarian cancer. Nowhere near enough is being done. I am sorry. You are so right, it must hurt. It is like the pink ribbon trampling on the teal. What the heck? Since when does it have to be a competition? But, sadly, I think it is a competition for research dollars. And with the link between breast and ovarian cancer, it simply does not make sense. All cancers need attention. We need a cure for ALL cancers. Thank you for your comment. I am sighing right with you. Pinktober in September, wow. As you said, we shouldn’t be surprised should we? Who would have thought pink branding would turn into such a successful marketing tool? 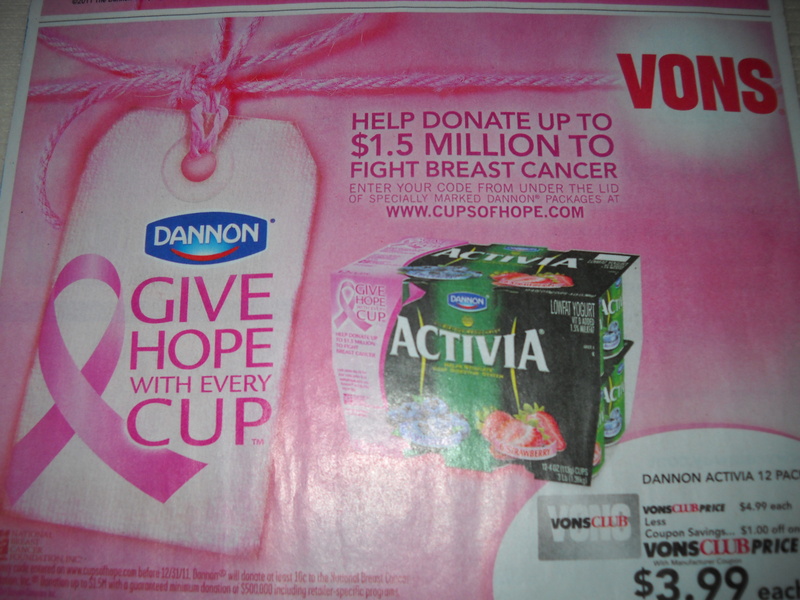 The fact that you already found coupons is proof that the pink is all about marketing and profits. And it looks like they just can’t wait to get a jump on things. It’s a sad commentary. I’ve always said I wouldn’t care so much if truckloads of dollars were being dumped into research, but sadly as you pointed out, this is not the case. Your statement, “I do not look forward to the false hope that pink sells,” really says it all. Thanks for the thought-provoking post and for mentioning NP too. Thank you for your comment and kind words. Like you I have been thinking about SGK for a while. I have written a little bit in the past about my disgust over how little goes to research. But, I guess I felt particularly peeved lately – especially upon seeing that ad. I haven’t been looking forward to Pinktober. And Teal Toes points out that SEPTEMBER is ovarian cancer awareness month. Sigh is right. You make such a great point – that the early jump on things is clear evidence that it is for profit. Ugh, ugh, ugh. Thank you again for your comment and thank you for your wonderful blog, I enjoy it so much! Such a powerful essay. “That pink shirt didn’t save me. Research saved me – if I am even saved (I am thankfully, gratefully NED: “no evidence of disease”)…Women who gave their last days of an aggressive cancer to participate in early trials of Herceptin, they saved my life or at the very least, prolonged it…Awareness did not prevent my cancer. Awareness is not a cure. And, we still, after so many years of pink branding, really do need to race towards research to cure all cancers.” Thank you. Thank you Gayle! I really appreciate your comment. And, I am loving your book, impossible to put down! Wow, very powerful. Thank you for writing it! I’d rather take the money spent on unnecessary stuff and give it ditectly to research for metastatic BC research. Just don’t where to give. I agree with Toes…….with all due respect to my BRCA sisters, as an ovarian cancer survivor it really makes me angry to see all the pink stuff rolling out earlier and earlier every year. I think after all this time, we are damn well AWARE of breast cancer! And until I started following you fierce bc advocates on Twitter & FB, I never knew how little of the money raised from the SGK ‘big pink machine’ went to actual research. Now I’m really pissed! I’ve sported the pink ribbon, bought the pink products all the while thinking I was helping. Aaargh! We’re aware people! How about we work on that cure now? And while we’re at it, why don’t we make EVERY cancer patient feel like their life has VALUE by demanding the government fund cancer research in general. That would be great! AND September IS Ovarian Cancer Awareness Month!!! I want my month!! I want TEAL towns! I want more OC walks like the one I participate in here in Raleigh!! I want teal products!!! Pink can wait until 10/1!!! I think that not enough is said about ovarian cancer, so I made my own PSA. I’m wearing teal every day this month, teal tips & toes too, just to spread the word! It is quickly becoming my life’s mission. I love that you’re asking questions and holding these organizations accountable for where our money is going. Keep after them! Until they make us their true focus. Love to you! Thanks for all that you do! Thank you so much for your comment!!! I am angry for you! I agree with you 100%. My only regret is that in writing this most recent blog post, I failed to point out that “Big Pink” is trampling on ovarian cancer awareness month. Shame on them! Yes, we need to make organizations accountable. We are so beyond AWARENESS!!! Good grief. That is not money well spent. As Kathleen above said, I would rather the money went directly to research too! I am so glad you are a survivor and so glad you are on a mission! I am joining you in teal this month, starting today! (Pictures to follow)!!! Thank you again for commenting on my post, I am honored to be among so many well spoken women! Have you seen Nicole’s PSA? It is awesome! Love the “Fierce” t-shirt you wore to chemo. I wore my Monty Python’s Holy Grail T-shirt proclaiming “I’m not dead yet!”. I still wear it to my various follow ups. To me, it was a proclamation against my lymphoma, that I wasn’t going to just lie down and be taken. And of course I agree, especially that any product that has been linked to cancer should never be used as a sponsor. No matter how much money it adds to your “Increase in net assets”. what does that mean, anyway? and why isn’t it just being used to add to either research, screening, or treatment? I wore my shirt with the same feeling behind it . . . that I was not going to just lie down and be taken. I agree with you that any product linked to cancer should not be used as a sponsor. It just doesn’t work in my mind at all. Thank you again for your comment. I am going to go looking for an “I’m not dead yet” t! No, I have not seen her PSA yet. Thank you for providing a link to it, I look forward to watching it! Hi Lisa, great post. Of course it’s not even October and already the pink profiteers are out in force, although truth be told it does just seem like a year round seasonless business now. 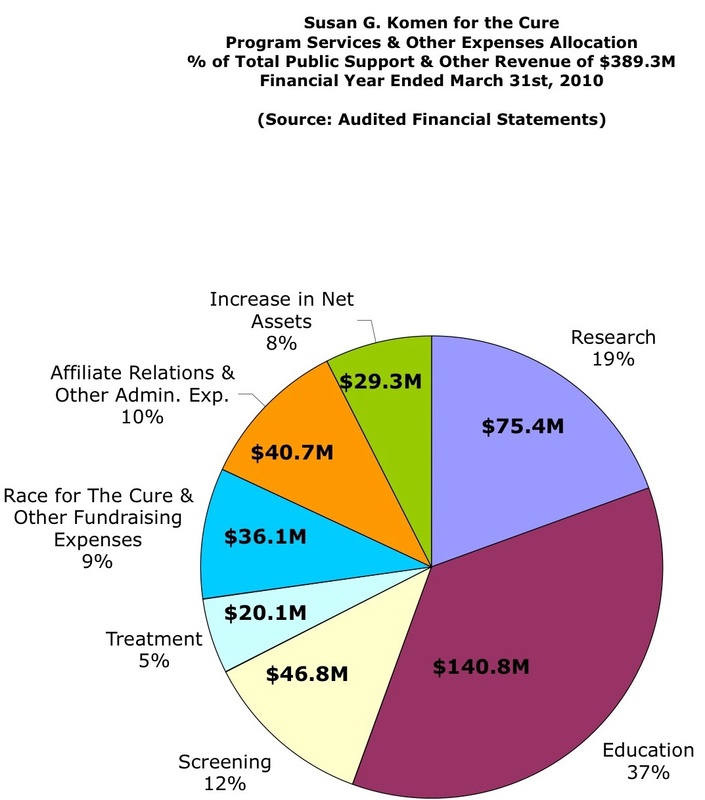 Thanks for including my pie chart analysis of Komen’s 2010 financials…the full story link is here if your readers are interested to know more on that issue (http://cancerculturenow.blogspot.com/2011/03/komen-by-numbers-2010-and-still-no.html). With the voices of dissent growing everyday, perhaps soon we can hope for a time when the vested interests stop, and money goes to actually stopping this epidemic through research to metastatic breast cancer; the kind that kills. Thanks for adding your voice. Oh my gosh, first of all I am SO sorry as I did not attribute your pie chart to YOU or ask if I could use it! Good grief! I did my blog post in bits and pieces (in between working and chores) over a period of time, coming back to it after breaks and obviously I took a mental break an completely goofed. I will edit the post to reflect your blog post as the original source for the pie chart and you as the creator of it (assuming you are okay with my using it). I am so embarrassed that I did that. Before cancer I was a writer and never would intentionally plagiarize or “borrow” something without permission and proper attribution. Now, apparently I do it unintentionally. Grrr. I can only say that my post chemo brain, while much better than last year, still leaves me forgetting what I need to do. Sigh. And just as I am reading your post (and turning red) I am remembering that I completely forgot to order the business cards I needed to have for an event tomorrow (too late to do it now) and that I forgot to put the soup away last night (the soup I spent hours making and was so proud of myself for being able to do) that now has to be thrown away . . . I could add a list that is a mile long of things I have forgotten or not thought through all the way. Grrr. It should be the topic of a new blog post for me: the fog after chemo. I try to push it aside (the fact that my brain is not the same as before) and convince myself that I am functioning close to the before cancer & chemo days Lisa. But, I am not . . . obviously. So, Rachel, may I use the pie chart that you created in my blog post? Great article, thanks for sharing your thoughts and insight. I also cringe at Pinktober, but maybe for a slightly different reason. You see, if you ask most people what the number one cancer killer of women is, they will answer “breast cancer”. (Trust me, I’ve asked hundreds). But the reality is that lung cancer kills more women than breast, ovarian and cervical cancers combined. And it kills more men each year that prostate or colon cancer. Lung cancer is the number one cancer killer. And yet, in spite of that shocking fact, it is the LEAST FUNDED of all the major cancers. How does that make any sense? The main reason is the stigma associated with the disease; people assume that if you have lung cancer, you must be a smoker, so you deserve it. The truth is, however, that more people who *never* smoked will die from radon-induced lung cancer than will die AIDS, drunk driving, or home fires. While breast cancer has an overall survival rate of about 88% (awesome! ), lung cancer’s survival rate remains largely unchanged for the last 40 years – at a staggering 15%. What this also means is that so many women survive breast cancer and go on to advocate for the cause, but for lung cancer, they simply don’t live long enough to make a difference. Because there has not been a early detection screening protocol for lung cancer, it is usually found in the late stages; many newly diagnosed people will not be alive in a year. It just doesn’t leave many people to do the work of cancer advocacy. Komen has done an amazing job of educating the public and marketing their brand. Unfortunately, the public remains largely ignorant about the number one woman’s cancer killer. If you’ve read this, you now know more about lung cancer than most people that you know. I urge you to get involved. Some organizations you can check out: http://www.dustyjoy.org, http://www.wtflungcancer.com/, http://www.lungcancerfoundation.org/. Thank you so very much for your comment. Your message is such an important one! So few know that it is the number one killer. I have realized that there is no early detection protocol for lung cancer, no early screening . . . but, when I read your comment all I could think was after all this time, how can that still be? How can we tolerate this? You are so right about the stigma – the assumption that a person with lung cancer must have smoked and therefore brought it upon themselves – thank you for pointing out how incorrect this assumption is – it simply is not true. A friend of mine died of lung cancer at the age of 47. He never smoked. At his memorial service I heard someone say “I never knew he smoked” Unbelievable! This person assumed that my friend had smoked because he died of lung cancer. You are right, we need a call to action. We need survivors of all cancers to advocate for lung cancer research, early detection. I look forward to visiting the links you provided (thank you). I will definitely write about this topic on my blog and provide the links you have provided on my facebook page. Thank you again for your very thoughtful comments and for sharing such an important message. Wonderful post! Happy to see someone else’s thoughts aligned with my own, or rather put them into words. I’m also sick of all the “awareness” speak, without much action. Good luck to you in your healing journey!! Thank you for your comment Stancie. I am with you, sick of the “awareness” speak and the umbrella that it seems to provide for money grabbing . . . it makes me mad. So many of the pink products don’t even claim to send any money anywhere . . . it is horrible People how mean well, buy products that are pink because they think the money is going to something good, will help someone, maybe even cure someone. The idea that so much money is simply taken in exchange for the “awareness” it creates is appalling to me. Lisa, thank you, thank you, thank you for this posting. You are SPOT-ON and fierce!! Yes, we now have Pinktember along with Pinktober. Hell, why not just extend it to the December holiday season. After all, don’t we need a Pinkvember and Pinkcember, too? I am a breast cancer survivor, whatever that means. Frankly, I am dreading the stores. I am trying to think of some way not to go to grocery stores, but to have my food delivered. But they’d probably be delivered in a pink bag, which I could always use to vomit in. And you are right: it’s pathetic how ovarian cancer gets pushed by the wayside to make room for more pink. A dear friend of mine died of ovarian. Thank you for your comment. I love your sense of humor. I am sorry for the loss of your friend to ovarian cancer. My family lost a dear friend to ovarian cancer, she was just 47. Oh, and I’m adding you to my blogroll. You are awesome. Oh, thank you! I am honored! Why do you think we are so (painfully) aware of some cancers – i.e. breast cancer, and so (again, painfully) UNaware of others, i.e. ovarian, lung, liver? Is it more glamorous to save our breasts rather than our lungs or our colons? Is it because it is a visible, socially worshipped symbol of our femininity? Why don’t we come out en masse, like we do for breast cancer, for lung cancer or colon cancer walks?? I think we need a societal shift from individual cancers to advocating for ALL cancers. It’s the #2 cause of death in America, second to heart disease. Don’t they all deserve the same kind of attention? Just a few thoughts on this Sunday morning. Here are some Tweets/FB updates/signature blocks that can be used in OCt please feel free to adapt. Teal Toes, any additions?? Metastatic breast cancer claims 45,000 lives annually in the U.S. As one of 155,000 U.S. people living with MBC, I have a vested interest in educating people about this incurable disease and urging them to support research that helps people with advanced breast cancer live longer. In October, 2009, the U.S. Senate and House voted to support the designation of October 13 as a National Metastatic Breast Cancer Awareness Day. Oct 13 is National Metastatic Breast Cancer Awareness Day. It highlights the needs of the metastatic breast cancer community. Treatment is ongoing and unrelenting for the 155,000 women and men living with metastatic disease.